Horseback's mastermind, the ever-prolific Jenks Miller, has had listeners wrapped around his fingers for about seven years now. With his knack for spinning a web of musical mystery, one never knows exactly what to expect from a Horseback release other than quality. 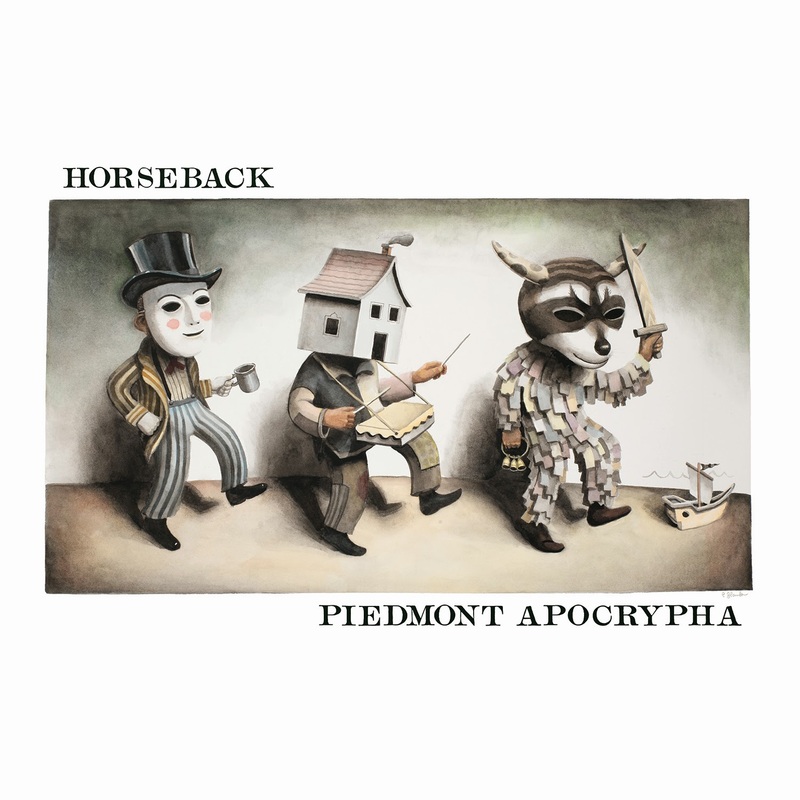 With his newest, Piedmont Apocrypha, we see Horseback's continued evolution in a strange new light. Whereas most prior releases have been rooted in a single feeling or sound, here we see Horseback looking forward while also touching on certain golden moments in its own career. While many bands move toward a certain sound in an attempt to appear mature or marketable, the growth displayed here feels natural and precise. The organic majesty of this project is what brings back time after time, and this album seems geared to be another jewel in this artist's worthy history. In fact, by the end of this review you'll hopefully understand why I feel this single album may be the best introduction to Horseback for someone who wants to comprehend this artist's entire catalog. Before even playing the first track, I notice that the artwork reminds me more of something you'd see as a Current 93 or Chameleons album cover than something from an artist who has been associated with blackened anything in any way. The timelessness of the artwork is fitting, as this seems to be Horseback's first work that stands outside of a chronology and instead could exist alongside any prior (or future) album of theirs. From the first line (and often repeated mantra) of "Passing Through," Miller seems to be acknowledging the transitory nature of all life and art: "I was born to lose; I won't have this form forever." While I can safely argue that Horseback is a musical victory, the second half of this line rings truer for this shape-shifting artist than most. The song itself even feels like a piece of a voyage. Not necessarily the beginning, but definitely not the end. I feel like the first two tracks are something akin to witnessing sunrise while traveling down a long dirt road. There's a sense of beauty, light tension, and a fulfilling sense of being alone, but not quite lonely. The individual discover's oneself only through experience, and this album may well be a documentation of the strength of one. The singular vision of this album doesn't narrow the experience, but instead allows for a meditative, focused sound. At times it seems that each instrument is following the same path rather than complementing each other. The blending of percussion (when it's present), melody, and voice brings the music to a more primal place. There is something so inherently right about the fusion of separate elements here, as the sum of the parts leads to a shimmering glory that goes far deeper than it would if each instrument's voice were competing with its peers. Instead, balance is the goal here, with every tone uniting to guide the listener to a peaceful, reflective state. Even when the instruments separate into a sort of glistening pastoral vibe, there's such a sense of harmony and peace as everything weaves into and through itself. While this is blissful music that often leans toward elements of drone, this is no Impale Golden Horn. The instruments are given space to breathe, and the weight of the air in this album gives it a certain sort of intimacy. The album's journey culminates in the unexpectedly monstrous "Chanting Out the Low Shadow," which sees Miller taking one last glance at shades of Horseback's past before moving onward into a final, hypnotic resting place. Whether the album is a voyage of a single day or a lifetime is hard to say, but it's well worth experiencing. Piedmont Apocrypha is now available for pre-order from Three Lobed Recordings in both vinyl and CD formats, with a release date scheduled for March 25th. Lovely, lovely review Harold. I also think the pastoral vibe is there. Thanks, but I didn't write this one. Benjamin did. And he did a great job, as always.